Runway carpet is usually red but how about a vibrant mix of colours and designs to really define the way? Love the idea of wearable rugs - like wearable art! Great design, especially like what you see in Korhani rugs, cushions, and furniture easily translates to the purses and clothes that captivated the audience, last night. 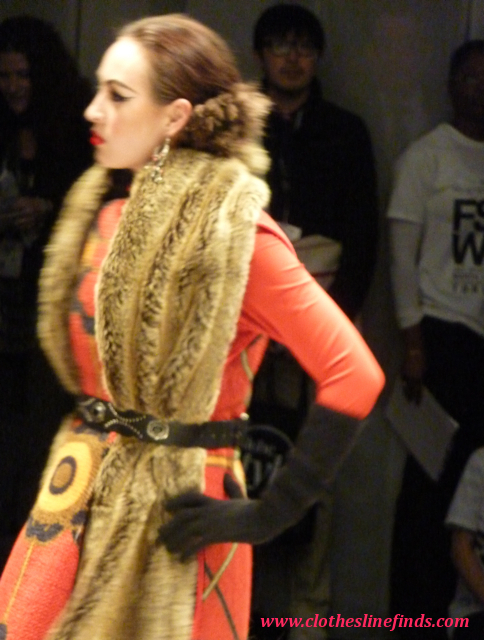 Multi layered and textured fabrics took the form of capes, vests, hats, coats, dresses and more. Golds, pinks, oranges, black and white, collared, belted, ribboned, masked apparitions marched towards us and invited us in to the ultimate, exotic kingdom. Picture yourself draped in silk tapestries, warm but dramatic, ready to take on travel and advenure or just luxuriate in the castle you call home. KORHANI.COM for more info and online shopping at 50% off during Fashion Week.